You’re running through the woods, a map in your hand. A compass points direction as you race the clock, looking for hidden flags. This is orienteering, a sport of quick thinking and backwoods navigation where a wrong move will get you seriously lost. The skills used by orienteers are fundamental to off-trail navigation. Forget GPS devices. A good orienteer is faster. A compass is more reliable. A good map is more accurate. 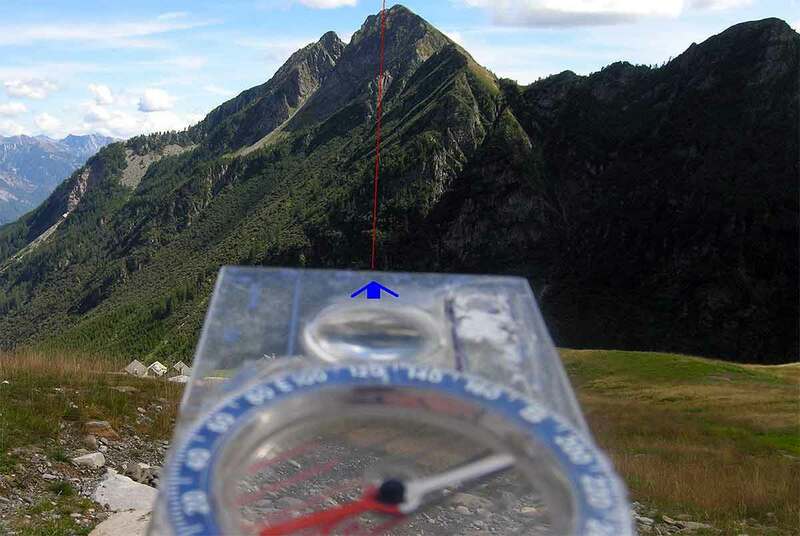 Expert orienteers can be dropped any place on the planet, handed a map and a compass, and find their way out. Learn these skills and become a master of backwoods travel. 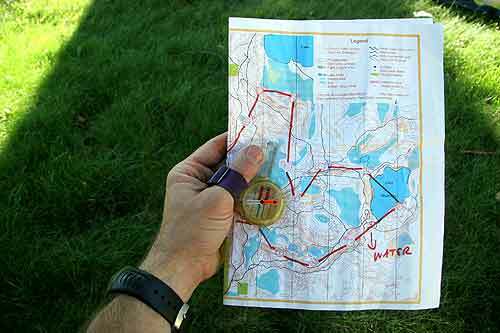 This quick guide to orienteering basics is a primer for experienced backwoods wanderers and the directionally challenged alike. Apply these tricks next time you’re in the woods with a map on an adventure of your own. The sport’s name comes from a basic map maneuver: Orienting the map to mimic your environment. Essentially, the top of an orienteering map — which always represents north — needs to always be facing to the north no matter which direction you’re facing. For example, if you’re standing on a trail looking north, holding a map horizontally in your hands, the map can be held normally (all text and characters right side up). But flip around so you’re looking south, and the map needs to be read upside-down to mimic reality. The top of the page will still be facing north. Same thing if you turn to face east or west; keep the top of the map always to the north. The technique keeps features mirrored to their representation on the printed page. One simple rule: All you need to know is north. Modern compasses can come with mirrors, degree markings, spinning dials, and sights. For most basic navigation, all these accouterments are not needed. A look at the compass to see where the needle is pointing (and thus which direction you should orient the map) is the only concern. 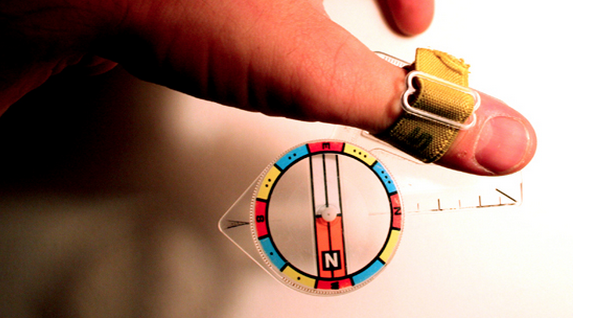 A technique for finding an orienteering flag — or any precise point on a map — is an attack point. These physical features or landforms can be used as a directional. Say a destination is deep in a thick section of forest. Instead of wandering in to search, identify a nearby trail intersection, bend in a creek, or other standout land feature. At the prominent feature — the attack point — line up a route to your ultimate destination, estimating direction and distance from the map. It might be 300 meters southeast, for example. Take that knowledge, get a compass bearing, and go. A common orienteering map reveals a tangle of topographical lines and esoteric iconography representing everything from boulders and bogs to power lines, fences, hills, ravines, and depressions in the land. Blotchy yellows and greens portray vegetation boundaries. Lake and rivers are blue. Buildings look like blocks. Roads and trails are represented by lines, dotted and solid. The graphical overload can be confusing at first. But the system of shapes and lines — developed in Scandinavia and honed over decades — becomes a streamlined system of information for experienced orienteers. These maps are similar to simple topographical maps used to the navigate backcountry. If unfamiliar, spend some time studying your maps and seeing how features relate from the map to the real world. Typical wilderness maps from the United States Geological Survey are of the 1:24,000 scale variety or greater. In orienteering, the most common scale is 1:10,000, which hugely increases the amount of detail. An inch on a 1:24,000 scale map, for example, represents about 2,000 feet in the real world; in the 1:10,000 scale an inch equals about 800 feet. This greater detail allows for extremely precise navigation. In orienteering, objects such as boulders, park benches, picnic tables, fences, and the subtle crooks of a ravine are obvious on maps of 1:10,000 scale. Orienteers often run with a map in hand, keeping a thumb planted on the map near their current location. The technique is simple: As you hike or run through the landscape, move your thumb to the new place on the page to represent your current position. Reposition your thumb at stops, at major land features, or before heading into a tricky section of the course. The technique keeps you more focused on the navigation at hand and lets you see, at a fast glance while moving, your approximate location among the tangle of mapped detail at any time. 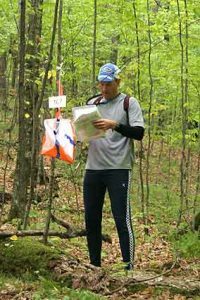 –Learn more and find local orienteering meets and clubs at the United States Orienteering Federation.